As you can see from the pattern pieces; this is a pretty interesting design! 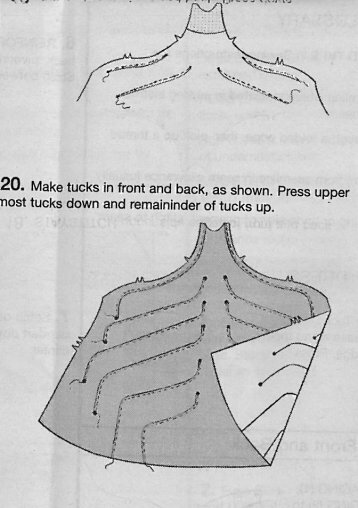 The instructions that come with this pattern basically stink like a monkey and I don’t believe for a minute they actually show how Rucci would make a dress like this, although I do think he would make it entirely on a regular sewing machine as the instructions imply. The pintucks are marked on the pattern pieces, but there is nothing that specifically indicates how wide they are supposed to be. However, the pattern itself does offer an intriguing clue; the darts are hidden in the seams of the pintucks. I measured the difference between the marked dart lines and a pintuck, and its 1/8 of an inch (3 MM). So I’m convinced these pintucks are supposed to be 1/8 inch (3mm) tall. Shannon Gifford has suggested on Stitcher’s Guild that at a twin needle is not really the best choice because there is no twin needle wide enough for these pintucks. I do think the widest Schmetz twin needle might produce something close to 1/8 of an inch but I won’t use a twin needle for other reasons: (1) The front pattern piece is really large – it spans the entire width of the fabric in layout, selvage-to-selvage. I believe that trying to maneuver a double needle through my wool jersey and around those curves is asking for trouble and (2) there is no way the darts could be hidden when the pintucks are stitched with a twin needle. No backstiching the ends of the pintucks; I suspect Rucci does the same thing that Chanel does on their quilted jacket linings; the needle side thread tails are threaded onto a hand sewing needle, brought to the wrong side, and tied off with the bobbin thread. Truthfully, I can’t think of any other way to do these pintucks without losing control. Of course I’ll have to test this theory before I plunge into the real thing. The second illustration shows the bodice piece; and this is oriented as in the finished garment. On the top drawing you can see interfacing at the neckline and two sets of bust darts. 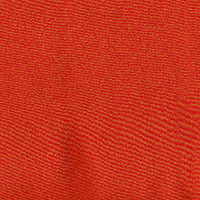 The darts are made first and then the pintucks are stitched, and the stitch line of the pintuck must precisely follow the stitch line of the stiched dart because in the finished garment the darts are invisible (just look closely at the pattrern envelope photo – there are no darts to be seen even though they do exist). 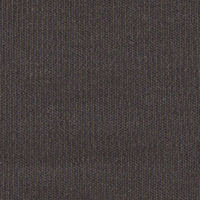 The angled straight edge is the center back seam. This pattern has an additional challenge – there is no provision for above waist adjustments, so that means for someone short-waisted like me I’ll have to figure out how I can deal with this. The trick will be to raise the waist with as little distortion to the pintucks as possible. I think I’ll need to make a full size test garment straight from the pattern, unadjusted, and then work out my figure adjustments, and then transfer those changes onto a new pattern piece. But this isn’t so bad because I’ll get to practice and perfect those pintucks! I think I’ll also head over to Amazon to order “The Art of Weightlessness” – there might be some insights to be gleaned from the Rucci garments in that book. Vogue has just released another Ralph Rucci pattern, and after a summer sewing hiatus I’m in the mood to tackle a challenge. Rucci is kind of the Frank Lloyd Wright of fashion – his clothes are pretty much meant to be worn as deisgned and styled, without too much deviation from the original. It seems the consensus on this pattern is not quite as universally favorable as the dress he did last summer, but I really like this style and I’ll wear it. It has a Emma Peel 60’s-ish quality to it that I really like. So here’s what this one will be: two Gorgeous Fabrics selections; an extra wide olive grey wool jersey and a bright guava stretch silk charmeuse for a bold lining. Vogue had a two-day on-line sale this week and pattern was marked down 75%, hopefully everything will arrive soon. 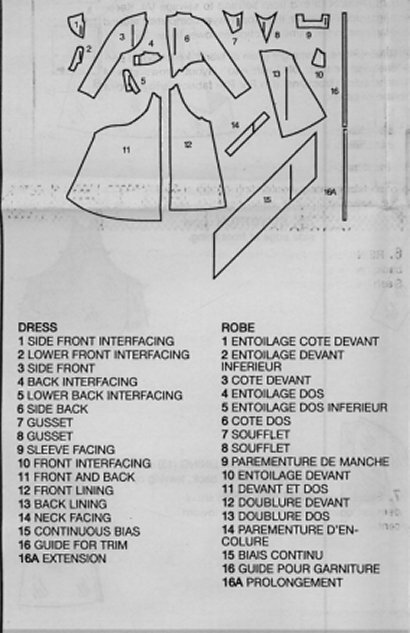 It will be interesting to see how the pin tucks are done on this dress; I assume a wide double needle and a walking foot would be used, but I’ll just have to see what the instructions say. I think I’ll make oak tag stencils for the marking the pin tucks with chalk or a sewing marker. Another thing to think about is whether a stabilizer might be needed under the pin tucks. 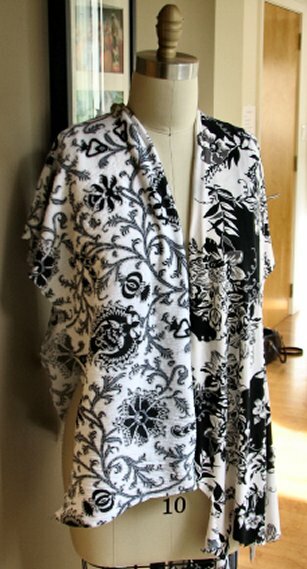 And then there is the lining – are those pieces pin tucked as well? So many questions!